These all-steel electric interurban cars are two of eleven built over several years in the latter half of the 1920�s by the Brill company of Philadelphia for service between that city and western suburban towns. Three quarters of a century later, they are soon to become the mainstay of electric trolley operations at the New York Museum of Transportation. The P&W�s third-rail line was originally built in 1907 from the 69th Street Terminal in Upper Darby, on the western outskirts of Philadelphia, to Strafford, PA. Five years later, the P&W added a branch to Norristown, PA, connecting there with the Lehigh Valley Transit Company, thus permitting that company to operate its "Liberty Bell Limited" cars from Allentown through to 69th Street Terminal. Over time, the Norristown portion of the P&W operation grew in importance and the Strafford segment was reduced to branch line status. In later years, the 160-series cars were used exclusively on this branch and became affectionately known as "Strafford cars" to those who followed their long careers. The cars were originally numbered 60 - 70. Originally equipped with Westinghouse 535B 60 hp motors, 30 inch diameter wheels and an extra set of side doors, located about a third of the way back from the front end, the cars were modified in 1931 when the famous "Bullet" cars arrived on the property. All cars had the side doors removed at this time. Also, the 30 inch wheels were replaced by 25 inch wheels, and truck bolsters were altered in order to make the anticlimbers more compatible with those of the "Bullet" cars. Trolley poles necessary for street running in Norristown were removed when the new elevated terminal in Norristown opened. Cars 160 - 164 and 170 had their motors rebuilt to Westinghouse 537 100 hp motors in order to permit speeds up to 70 mph. Cars 165 - 169 were not modified at that time and were limited to rush hour service to Bryn Mawr. After World War II, their motors were also modified to 100 hp. Philadelphia and Western Railway merged with Philadelphia Suburban Transportation Company in 1954, which was in turn purchased by Southeastern Pennsylvania Transportation Authority in 1970. The Strafford line was abandoned in 1956, but cars 160 - 170 remained serviceable and saw use on the Norristown line, usually during rush hours, well into the 1980's! Cars 160, 167, 169, and 170 have been scrapped. 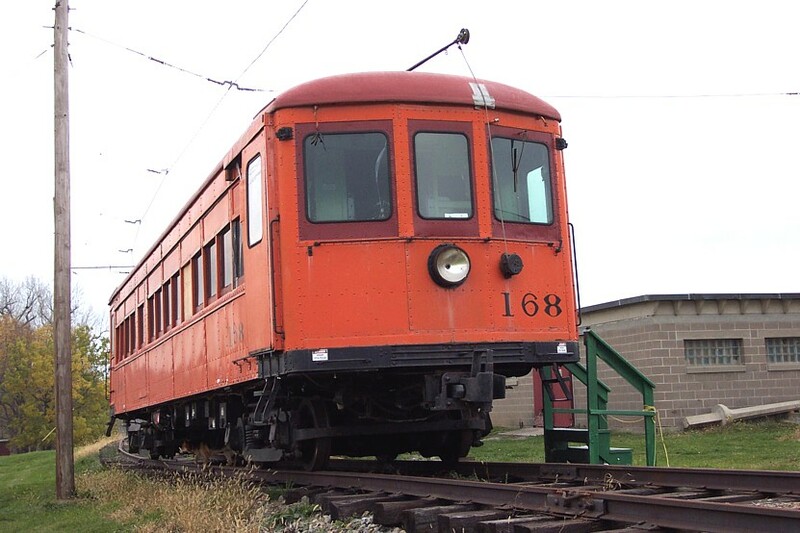 The body of car 166 was used for a short time as a lunchroom in Wilmington, Delaware, and others in the series went to museums or individuals. 168 and 161 were purchased by the Keokuk Junction Railway in Iowa for tourist duty and were extensively renovated there. In addition to enhancing tourism in the area, car 161 was also able to fill an urgent need during the 1993 flooding of the Mississippi River, carrying local residents across on a nearby power dam which happened to be set up with 600 volt DC overhead wire for maintenance equipment. The two cars were obtained by our museum in late 1996, with Car 168 the first to arrive, on Thursday, November 7 to the click of cameras and the whirring of camcorders. Car 161 arrived shortly after on Wednesday, November 13. After a 60 year working life, a lot of cross-country travel by trailer truck, and restoration by museum volunteers, these two cars look forward to the museum rail line�s electrification and to many more years of doing what they were designed to do�carry people.